Restaurant Week is coming back for 2 weeks during March 9-14 and March 16-21. Per usual participating restaurants will be offering special price fixed meals. 3 course lunches for $20.08 and 3 course dinners for $33.08. I got a mailing that states that right now, until February 10th, American Express cardmembers can get a jump on making advance reservations at Restaurant Week restaurants before the general public. Call the restaurant to make the reservation and "mention any American Express Card." See below for the restaurant list. 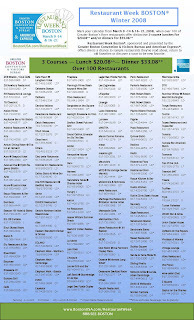 0 Response to "Boston Winter Restaurant Week 2008"